We are pleased to announce the 22nd year of the Scholarship scheme for music students. A total of 37 Scholarships in 25 countries will be awarded to full-time students in 2010/2011. 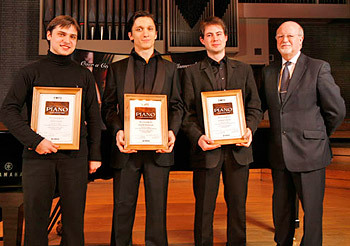 In 2010/2011, the scholarships’ discipline is Piano. Regulations may vary depending on the country. Applicants are to download and fill out the application form and to send it to the appropriate contact address together with a recording of two titles. * Please make sure to send a CD, DVD or Mini Disc with your recordings together with the application form. * The length of both pieces should not exceed more than 20 minutes. * The quality of the sound does not have an effect on the later selection process. The closing date for applications for the 2011 Scholarships is November 30th 2010. In case of questions, please contact your administration office. Yamaha Music United Kingdom Ltd.
Demikian kami sampaikan tentang Piano Scholarships from Yamaha Music Foundation of Europe 2010 semoga informasi tentang Piano Scholarships from Yamaha Music Foundation of Europe 2010 ini bermanfaat.